Educators are always looking for new ways to teach and inspire. The latest can be found along the waterways of New York City. Opened last fall, the New York Harbor School brings maritime history and experiences to underperforming students, helping them to learn math, English, and other subjects. The school, one of the small institutions established under the New Visions for Public Schools program, also exposes them to new environmental, historical, and cultural opportunities available only at the city’s shoreline. Every day, 25 students in the freshman class of 125 travel from the school’s main campus at Brooklyn’s Bushwick High School to South Street Seaport for their Introduction to New York Harbor class. At the Seaport, there is a quiz, a lesson, and a harbor-related activity, all designed to teach water ecology, biology, history, and research skills. The group then visits various sites around the city — such as the Lettie G. Howard, an 1893 fishing schooner operated by the Hayden Foundation — to apply those lessons and learn others. Back in Bushwick, students follow a state-mandated curriculum designed to get them up to grade levels. In addition, a Marine Technology class teaches boatbuilding, seamanship, communications, and global history — students explore how other civilizations related to the water by constructing models of historic boats. In junior year, students will choose one of four areas of concentration, each with its own set of graduation requirements: Marine Science, Marine Technology, Conservation and Public Policy, and Maritime History and Literature. The size of the school aids the learning process; every student is known well by at least one adult in the school, who helps with both counseling and tailoring an academic plan to individual needs. Fisher worked to create the Harbor School after several years at the Waterkeeper Alliance. With a deep interest in public education, he met with Urban Assembly President Richard Kahan in 2002 to see how they could merge the rising awareness of the waterfront and the growing movement toward small schools in New York City. Forming a partnership with the Urban Assembly, South Street Seaport, and the Waterkeeper Alliance, Fisher submitted a proposal for the Harbor School that was accepted by New Visions. 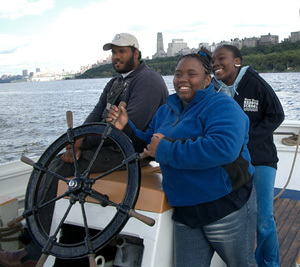 The first freshman class is now involved with a variety of summer programs, such as manning the Howard at sea as part of a tall-ships race. Fisher, principal Nathan Dudley, and other teachers and administrators, meanwhile, are readying the next class of ninth-graders for the fall.